A multitude of languages are used in Canada. According to the 2011 census, English and French are the mother tongues of 56.9% and 21.3% of Canadians respectively. In total 85.6% of Canadians have working knowledge of English while 30.1% have a working knowledge of French. Under the Official Languages Act of 1969, both English and French have official federal status throughout Canada, in respect of all government services, including the courts, and all federal legislation is enacted bilingually. New Brunswick is the only Canadian province that has both English and French as its official languages to the same extent, with constitutional entrenchment. Quebec's official language is French, although, in that province, the Constitution requires that all legislation be enacted in both French and English, and court proceedings may be conducted in either language. Similar constitutional protections are in place in Manitoba. Canada's Official Languages Commissioner (the federal government official charged with monitoring the two languages) has stated, "[I]n the same way that race is at the core of what it means to be American and at the core of an American experience and class is at the core of British experience, I think that language is at the core of Canadian experience." To assist in more accurately monitoring the two official languages, Canada's census collects a number of demolinguistic descriptors not enumerated in the censuses of most other countries, including home language, mother tongue, first official language and language of work. In 2011, just over 7.1 million Canadians spoke French most often at home, this was a rise of 4.2%, although the proportion of people in Canada who spoke French "most often" at home fell slightly from 21.7% to 21.5% . Of these, about 6.1 million or 85% resided in Quebec. Outside Quebec, the largest French-speaking populations are found in New Brunswick (which is home to 3.1% of Canada's Francophones) and Ontario (4.2%, residing primarily in the eastern and northeastern parts of the province and in Toronto and Ottawa). Overall, 22% of people in Canada declare French to be their mother language, while one in three Canadians speak French and 70% are unilingual Anglophones. 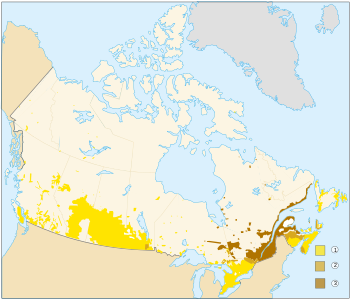 [nb 4] Smaller indigenous French-speaking communities exist in some other provinces. For example, a vestigial community exists on Newfoundland's Port au Port Peninsula; a remnant of the "French Shore" along the island's west coast. Ethnic diversity is growing in French Canada but still lags behind the English-speaking parts of the country. In 2006, 91.5% of Quebecers considered themselves to be of either "French" or "Canadian" origin. As a result of the growth in immigration, since the 1970s, from countries in which French is a widely used language, 3.4% of Quebecers indicated that they were of Haitian, Belgian, Swiss, Lebanese or Moroccan origin. Other groups of non-francophone immigrants (Irish Catholics, Italian, Portuguese, etc.) have also assimilated into French over the generations. The Irish, who started arriving in large numbers in Quebec in the 1830s, were the first such group, which explains why it has been possible for Quebec to have had five premiers of Irish ethnic origin: John Jones Ross (1884–87), Edmund James Flynn (1896–97), Daniel Johnson Sr. (1966–68), Pierre-Marc Johnson (1985), and Daniel Johnson Jr. (1994). The Bilingual Belt. In most of Canada, either English or French is predominant. Only in the intermittent "belt" stretching between northern Ontario and northern New Brunswick, and in a few other isolated pockets, do the two languages mix on a regular basis. According to the 2011 census, 94.3% of Quebecers have knowledge of French, and 47.2% have knowledge of English. Bilingualism (of the two official languages) is largely limited to Quebec itself, and to a strip of territory sometimes referred to as the "bilingual belt", that stretches east from Quebec into northern New Brunswick and west into parts of Ottawa and northeastern Ontario. 85% of bilingual Canadians live within Quebec, Ontario and New Brunswick. A majority of all bilingual Canadians, (57.4%) are themselves Quebecers, and a high percentage of the bilingual population in the rest of Canada resides in close proximity to the Quebec border. The language continuity index represents the relationship between the number of people who speak French most often at home and the number for whom French is their mother tongue. A continuity index of less than one indicates that French has more losses than gains – that more people with French as a mother tongue speak another language at home. Outside of Quebec, New Brunswick has the highest French language continuity ratio. British Columbia and Saskatchewan have the lowest French language continuity ratio and thus the lowest retention of French. From 1971 to 2011, the overall ratio for French language continuity outside of Quebec declined from 0.73 to 0.45. Declines were the greatest for Manitoba, Saskatchewan, and Newfoundland. Two of Canada's territories give official status to native languages. In Nunavut, Inuktitut and Inuinnaqtun, known collectively as the Inuit Language, are official languages alongside the national languages of English and French, and Inuktitut is a common vehicular language in territorial government. In the Northwest Territories, the Official Languages Act declares that there are eleven different languages: Chipewyan, Cree, English, French, Gwich’in, Inuinnaqtun, Inuktitut, Inuvialuktun, North Slavey, South Slavey, and Tłįchǫ. Besides English and French, these languages are not vehicular in government; official status entitles citizens to receive services in them on request and to deal with the government in them. Given the destruction of Indigenous state structures, academics usually classify Indigenous peoples of Canada by region into "culture areas", or by their Indigenous language family. In Canada, as elsewhere in the world of European colonization, the frontier of European exploration and settlement tended to be a linguistically diverse and fluid place, as cultures using different languages met and interacted. The need for a common means of communication between the indigenous inhabitants and new arrivals for the purposes of trade and (in some cases) intermarriage led to the development of hybrid languages. These languages tended to be highly localized, were often spoken by only a small number of individuals who were frequently capable of speaking another language, and often persisted only briefly, before being wiped out by the arrival of a large population of permanent settlers, speaking either English or French. Michif (also known as Mitchif, Mechif, Michif-Cree, Métif, Métchif, and French Cree) is a mixed language which evolved within the Prairie Métis community. It is based on elements of Cree, Ojibwa, Assiniboine, and French. Michif is today spoken by less than 1,000 individuals in Saskatchewan, Manitoba and North Dakota. At its peak, around 1900, Michif was understood by perhaps three times this number. Algonquian–Basque pidgin is a pidgin that developed in the 16th century from Basque in coastal areas along the Gulf of Saint Lawrence and the Strait of Belle Isle as the result of contact between Basque whalers and local Algonquian peoples. In British Columbia, Yukon and throughout the Pacific Northwest a pidgin language known as the Chinook Jargon emerged in the early 19th century which was a combination of Chinookan, Nootka, Chehalis, French and English, with a smattering of words from other languages including Hawaiian and Spanish. Certain words and expressions remain current in local use, such as skookum, tyee, and saltchuck, while a few have become part of worldwide English ("high mucketymuck" or "high muckamuck" for a high-ranking and perhaps self-important official). Alongside the numerous and varied oral languages, Canada also boasts several sign languages. Currently, Canada is home to some five or more sign languages (that number rising with the probability that Plains Sign Talk is actually a language family with several languages under its umbrella), belonging to four distinct language families, those being: French Sign Language language family, BANZSL family and two isolates (Inuiuuk and Plains Sign Talk). As with all sign languages around the world that developed naturally, these are natural, human languages distinct from any oral language. As such, American Sign Language (unlike Signed English) is no more a derivation of English than Russian is, all being distinct languages from one another. Some languages present here were trade pidgins which were used first as a system of communication across national and linguistic boundaries of First Nations, however, they have since developed into mature languages as children learned them as a first language. The sign languages of Canada share extremely limited rights within the country in large due to the general population's misinformation on the subject. Ontario is the only province or territory to formally make legal any sign language, enabling the use of American Sign Language, Quebec Sign Language (LSQ) and "First Nation Sign Language" (which could refer to Plains Sign Talk or any other language) in only the domains of education, legislation and judiciary proceedings. The only other language afforded any other rights is Inuiuuk which sees interpretation in the Legislative Assembly of Nunavut. There have been efforts to make LSQ an official language of Quebec, but all efforts have failed. The most spoken sign language in Canada, American Sign Language or ASL can be found across the country in mostly anglophone regions. The ties with Anglophone Canada are not due to ASL and English's similarity, they have to do with cultural similarities and linguistic history (as several ASL words are borrowed from English). As such, ASL can be found in areas where English is not the primary language, such as Montreal or Nunavut. ASL is part of the French Sign Language family, originating on the East Coast of the United States States from a mix of Langue des signes françaises (LSF) and other local languages. Alongside ASL, Quebec Sign Language or LSQ (Langue des signes québécoise) is the second most spoken sign language in the country. Centred mainly around and within Quebec, LSQ can also be found in Ontario, New Brunswick and various other parts of the country, generally around francophone communities due to historical ties to the French language. Although approximately 10% of the population of Quebec is deaf or hard-of-hearing, it is estimated that only 50,000 to 60,000 children use LSQ as their native language. LSQ is part of the Francosign family with ASL. As such, both languages are mutually intelligible. Maritime Sign Language is a BANZSL language. It was used as the language of education for Deaf populations in Nova Scotia, New Brunswick, and Prince Edward Island before ASL became available in the mid-20th century. It is still remembered by some elderly people but is moribund. The language, living alongside ASL, has produced a unique dialect of ASL in The Maritimes due to mixing of the languages. The exact number of speakers is unknown. Inuit Sign Language, also known as Inuiuuk (Inuktitut syllabics ᐃᓄᐃᐆᒃ), is a critically endangered language with some 50 speakers remaining. It is a language isolate and has only be found by researchers in Nunavut, however, there are theories it extends across the Arctic Circle. Little is known about its history, but efforts are being made to document and revitalize the language. Originally a trade pidgin, Plains Sign Talk, also known as Plains Standard or Prairie Sign Language, became a full language after children began to learn the language as a first language across many Nations. From "HANDS" and "TO TALK TO," Hand Talk was used as a lingua franca across linguistic and national boundaries across the continent and the language stretched across the provinces down through Mexico. As Plains Sign Talk was so widespread and was a spectrum of dialects and accents, it probably hosted several languages under its umbrella. One is potentially Navajo Sign Language which is in use by a sole Navajo clan. Another trade pidgin that may have become a separate language, Plateau Sign Language replaced Plains Sign Talk in the Columbia Plateau and surrounding regions of British Columbia, Washington, Oregon, and Idaho. It is now extinct. Scottish Gaelic was spoken by many immigrants who settled in Glengarry County, Ontario and the Maritimes — predominantly in New Brunswick's Restigouche River valley, central and southeastern Prince Edward Island, and across the whole of northern Nova Scotia — particularly Cape Breton. While the Canadian Gaelic dialect has mostly disappeared, regional pockets persist. These are mostly centred on families deeply committed to their Celtic traditions. Nova Scotia currently has 500–1,000 fluent speakers, mostly in northwestern Cape Breton. There have been attempts in Nova Scotia to institute Gaelic immersion on the model of French immersion. As well, formal post-secondary studies in Gaelic language and culture are available through St. Francis Xavier University, Saint Mary's University, and The Gaelic College. In 1890, a private member's bill was tabled in the Canadian Senate, calling for Gaelic to be made Canada's third official language. However, the bill was defeated 42–7. A portmanteau language which is said to combine English and French syntax, grammar and lexicons to form a unique interlanguage, is sometimes ascribed to mandatory basic French education in the Canadian anglophone school systems. While many Canadians are barely conversant in French they will often borrow French words into their sentences. Simple words and phrases like "c'est quoi ça?" (what is that?) or words like "arrête" (stop) can alternate with their English counterparts. This phenomenon is more common in the eastern half of the country where there is a greater density of Francophone populations. Franglais can also refer to the supposed degradation of the French language thanks to the overwhelming impact Canadian English has on the country's Francophone inhabitants, though many linguists would argue that while English vocabulary can be freely borrowed as a stylistic device, the grammar of French has been resistant to influences from English and the same conservatism holds true in Canadian English grammar, even in Quebec City. One interesting example of is Chiac, popularly a combination of Acadian French and Canadian English, but actually an unmistakable variety of French, which is native to the Maritimes (particularly New Brunswick which has a large Acadian population). Ottawa Valley Twang is the accent, sometimes referred to as a dialect of English, that is spoken in the Ottawa Valley, in Ontario. The Ottawa Valley is considered to be a linguistic enclave within Ontario. The initial European settlers to Newfoundland were fishermen from the various coastal villages of the English West Country of Cornwall, Devon, Dorset, Somerset, Bristol, and Wiltshire beginning in the 1500s (previously they visited in summer and returned). This set the basic speech patterns for those settlers who fanned out into isolated coves and bays along the island's 6,000 mi (9,700 km) of coastline to take advantage of the scattered off-shore fishing areas. Labrador, today the greater part of "Newfoundland", was then sparsely settled. The West Country dialects continued to be spoken in isolated coves and fjords of the island thus preserving varied dialects of what is today referred to as Newfoundland English. Some of the Irish immigrants to Newfoundland were native speakers of Irish making Newfoundland the only place outside Europe to have its own Irish dialect. Newfoundland was also the only place outside Europe to have its own distinct name in Irish: Talamh an Éisc, which means 'land of the fish'. The Irish language is now extinct in Newfoundland. Some Welsh is found in Newfoundland. In part, this is as a result of Welsh settlement since the 17th century. Also, there was an influx of about 1,000 Patagonian Welsh migrated to Canada from Argentina after the 1982 Falklands War. Welsh-Argentines are fluent in Spanish as well as English and Welsh. Acadian French is a unique form of Canadian French which incorporates not only distinctly Canadian phrases but also nautical terms, English loanwords, linguistic features found only in older forms of French as well as ones found in the Maritimer English dialect. Canada is also home to Canadian Ukrainian, a distinct dialect of the Ukrainian language, spoken mostly in Western Canada by the descendants of first two waves of Ukrainian settlement in Canada who developed in a degree of isolation from their cousins in what was then Austria-Hungary, the Russian Empire, Poland, and the Soviet Union. Canada's Doukhobor community, especially in Grand Forks and Castlegar, British Columbia, has kept its distinct dialect of Russian. It has a lot in common with South Russian dialects, showing some common features with Ukrainian. This dialect's versions are becoming extinct in their home regions of Georgia and Russia where the Doukhobors have split into smaller groups. The meagerly documented Bungi Creole (also known as Bungy, Bungie, Bungay, and as the Red River Dialect) is a dialect of English which evolved within the Prairie Métis community. It is influenced by Cree and Scots Gaelic. Bungee was spoken in the Red River area of Manitoba. In 1989, at the time of the only academic study ever undertaken on the language, only six speakers of Bungee were known to still be alive. English and French have equal status in federal courts, Parliament of Canada, and in all federal institutions. The public has the right, where there is sufficient demand, to receive federal government services in either English or French. Immigrants who are applying for Canadian citizenship must normally be able to speak either English or French. Until 1969, Quebec was the only officially bilingual province in Canada and most public institutions functioned in both languages. English was also used in the legislature, government commissions and courts. With the adoption of the Charter of the French Language (also known as "Bill 101") by Quebec's National Assembly in August 1977, however, French became Quebec's sole official language. However, the Charter of the French Language enumerates a defined set of language rights for the English language and for Aboriginal languages, and government services are available, to certain citizens and in certain regions, in English. As well, a series of court decisions have forced the Quebec government to increase its English-language services beyond those provided for under the original terms of the Charter of the French Language. Regional institutions in the Nunavik region of northern Quebec offer services in Inuktitut and Cree. For example, in Alberta, English and French are both official languages of debate in the Legislative Assembly, but laws are drafted solely in English and there is no legal requirement that they be translated into French. French can be used in some lower courts and education is offered in both languages, but the bureaucracy functions almost solely in English. Therefore, although Alberta is not officially an English-only province, English has a higher de facto status than French. Ontario and Manitoba are similar but allow for more services in French at the local level. Tamil 140,720 6999400000000000000♠0.4% 131,265 6999400000000000000♠0.4% 115,880 6999370000000000000♠0.37% Most of the Canadian Tamils live in Toronto. Cree, n.o.s. [nb 5] 64,045 6999180000000000000♠0.18% 77,900 6999240000000000000♠0.24% 78,855 6999250000000000000♠0.25% In the 2006 Census, this language was referred to simply as 'Cree'. Hungarian 61,235 6999180000000000000♠0.18% 67,920 6999210000000000000♠0.21% 73,335 6999230000000000000♠0.23% The majority of Hungarian speakers in Canada live in Ontario. A community of Hungarian speakers is found within a part of Windsor, Ontario. Montagnais (Innu) 10,230 6998300000000000000♠0.03% 10,785 6998300000000000000♠0.03% 10,975 6998400000000000000♠0.04% In the 2006 Census, this language was referred to as 'Montagnais-Naskapi'. ^ The percentage figures cited in this chart are the top languages spoken as a home language in Canada, shown as a percentage of total single responses. Source: Statistics Canada, 2006 Census Profile of Federal Electoral Districts (2003 Representation Order): Language, Mobility and Migration and Immigration and Citizenship. Ottawa, 2007, pp. 6–10. Data available online at: "Detailed Language Spoken Most Often at Home". 2006 Census of Canada: Topic-based tabulations. Statistics Canada. April 8, 2008. Retrieved January 15, 2010. ^ a b Office Québécois de la langue francaise. "Status of the French language". Government of Quebec. Retrieved November 10, 2010. ^ Official Languages Commissioner Graham Fraser is quoted in The Hill Times, August 31, 2009, p. 14. ^ a b c "Official Languages". Northwest Territories Education, Culture and Employment. Government of the Northwest Territories. Retrieved 19 July 2014. ^ Series A2:Population of Canada, by province, census dates, 1851 to 1976 (retrieved, July 19, 2010). ^ "Knowledge of official languages by age (Total), 2016 counts for the population excluding institutional residents of Canada, provinces and territories, 2016 Census – 100% Data". Statistics Canada. August 2, 2017. ^ Bilingualism Rate in Canada, Site for Language Management in Canada Archived February 13, 2009, at the Wayback Machine (SLMC). ^ a b "Aboriginal languages". Statistics Canada. Retrieved 2009-10-05. ^ a b Gordon, Raymond G Jr. (2005). Ethnologue: Languages of the world (Web Version online by SIL International, formerly known as the Summer Institute of Linguistics) (15 ed.). Dallas, TX: SIL International. ISBN 1-55671-159-X. Retrieved 2009-11-16 Since 2015 demands have been made to recognize all Aboriginal languages as official languages in Canada. ^ "What are the Official Languages of Nunavut". Office of the Languages Commissioner of Nunavut. Archived from the original on 2017-08-08. Retrieved 2017-08-14. ^ Handbook of the North American Indians. National Museum of Natural History. Smithsonian Institution. 2008. p. 1. ISBN 0-16-004574-6. Retrieved 2010-08-11. ^ a b Schuit, Joke; Baker, Anne; Pfau, Roland. "Inuit Sign Language: a contribution to sign language typology". Universiteit van Amsterdam. Archived from the original on 2 November 2015. Retrieved 1 August 2015. ^ Bakker, Peter (1989). "'The Language of the Coast Tribes is Half Basque': A Basque-American Indian Pidgin in Use between Europeans and Native Americans in North America, ca. 1540-ca. 1640". Anthropological Linguistics. 31 (3/4): 117–147. JSTOR 30027995. ^ Mike Cleven. "Chinook Jargon website". Cayoosh.net. Archived from the original on 2011-05-14. Retrieved 2011-01-18. ^ Lewis, M. Paul (2013). Simons, Gary F.; Fennig, Charles D., eds. "American Sign Language". Ethnologue: Languages of the World, Seventeenth edition. SIL International. ^ Province of Ontario (2007). "Bill 213: An Act to recognize sign language as an official language in Ontario". ^ "Inuit sign language makes debut in Nunavut legislature". CBC. 17 September 2008. Retrieved 1 August 2015. ^ Assemblée Nationale du Québec (2013). "Projet de loi n°14 : Loi modifiant la Charte de la langue française, la Charte des droits et libertés de la personne et d'autres dispositions législatives". ^ "Signs of changing times: Deaf Nunavummiut working to improve quality of life". Northern News Services Online. 27 February 2013. Archived from the original on 2016-01-07. Retrieved 23 August 2015. ^ Hand Talk: American Indian Sign Language Archived 2014-08-06 at the Wayback Machine. ^ Poplack, Shana (1988) Conséquences linguistiques du contact de langues: un modèle d’analyse variationniste. Langage et société 43: 23–48. ^ Poplack, Shana, Walker, James & Malcolmson, Rebecca. 2006. An English "like no other"? : Language contact and change in Quebec. Canadian Journal of Linguistics. 185–213. ^ Ronowicz, Eddie; Colin Yallop (2006). English: One Language, Different Cultures. Continuum International Publishing Group. p. 145. ISBN 978-0-8264-7079-9. ^ "Census Profile, 2016 Census - Canada". Statistics Canada. August 2, 2017. Boberg, Charles (2010). The English Language in Canada: Status, History and Comparative Analysis. Cambridge University Press. ISBN 978-0-511-78981-6. Edwards, John R (1998). Language in Canada. Cambridge University Press. ISBN 0-521-56328-3. Geological Survey of Canada; William Fraser Tolmie; George Mercer Dawson (1884). Comparative vocabularies of the Indian tribes of British Columbia: with a map illustrating distribution. Dawson Bros. Retrieved 25 August 2012. Wikimedia Commons has media related to Languages of Canada.